There are plenty of travel horror stories on the internet about “ugly Americans.” In their defence, those travellers aren’t usually aware they are doing anything wrong while on vacation. But if you aren’t aware of local customs and etiquette, offending locals may be inevitable. Though you will find that the hospitality and slower pace of some countries are markedly different than anything in the U.S., adjusting isn’t nearly as difficult as it seems. As you enjoy your travels, here are some tips to help you fit in, be a hospitable visitor and have the best experience ever while vacationing abroad. As you are traveling to escape the often hectic nature of American life, try to enjoy and embrace the more relaxed pace of other countries. Instead of being pushy and trying to speed race through your meals and activities, simply be patient and friendly. You don’t want to return home feeling like you missed your opportunity to relax or worse yet, more tired than when you left. Regardless of where you plan on travelling, do some research on local customs before you go. If you are greeted with a hug or a kiss on the cheek, return the favour graciously. When addressing the staff of any establishment you enter, try to be friendly and always introduce yourself with a “hello” or “good day.” The respect you show towards others will be returned to you whenever you need assistance. It isn’t difficult to be a classy tourist. When vacationing, pack some business casual attire along with your swimsuit and sandals. As you wouldn’t wear beach gear to a restaurant at home, you should try to dress appropriately when you are out on the town abroad. You should also try to understand and adapt to the dining traditions of your destination. It’s easy. Just pay close attention to others’ behaviours. And if you find yourself confronted with unknown foods, try your best to expand your palette or politely decline. When traveling to a country that speaks any language other than English, make an effort to learn key phrases before you travel. You should be able to return greetings and ask simple questions. When you use English, speak clearly and without slang, paying close attention to other people’s reactions to determine if you are being understood. Do not expect to be accommodated with English translation everywhere you go. Pick up and carry a language translation book and/or use a translation app on your phone. Remember, it is just as frustrating for others not to understand you. Be patient and understanding. If you find yourself staying in someone else’s home or any individual goes out of their way for your vacation, a small gift is always a nice touch. If you are invited to dinner, bring flowers or a bottle of wine. Tokens like these will be greatly appreciated and may even earn you some new friends. Obviously, gifts don’t have to be expensive; your good intentions will certainly be recognized on their own. Be generous with your tips. Most people in the service industry rely heavily on gratuities. But don’t overdo it. A tip far above the accepted amount could be perceived as an arrogant or flaunting of wealth. A doorman should receive $1 to $2 for carrying your luggage and up to $4 for securing a taxi. If a bellhop assists you getting to your room, $1 to $2 per bag is customary with an additional $2 to $3 for bringing a requested item. 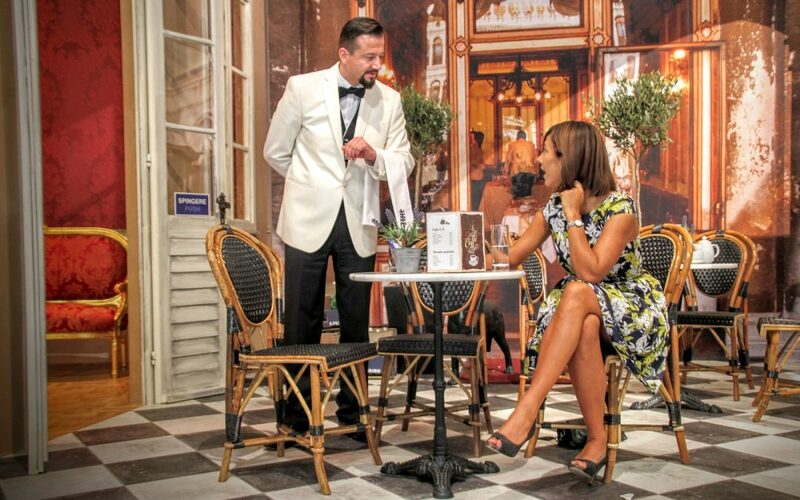 The concierge, always a valuable resource when traveling, deserves $5 to $10 when performing any special service and probably more when securing tickets to a sold-out event or a difficult dinner reservation. When dining, waiters and bartenders should always receive 15-20% of your total bill amount. It is also a good idea to offer tips of $2-3 to housekeepers and valets whenever they come to your assistance. Most importantly, enjoy your vacation. As long as you keep in mind that you aren’t at home and need to practice moderation and respect, you will always look like a smart traveler. You may even procure invites to explore and meet locals and truly experience your vacation destination. 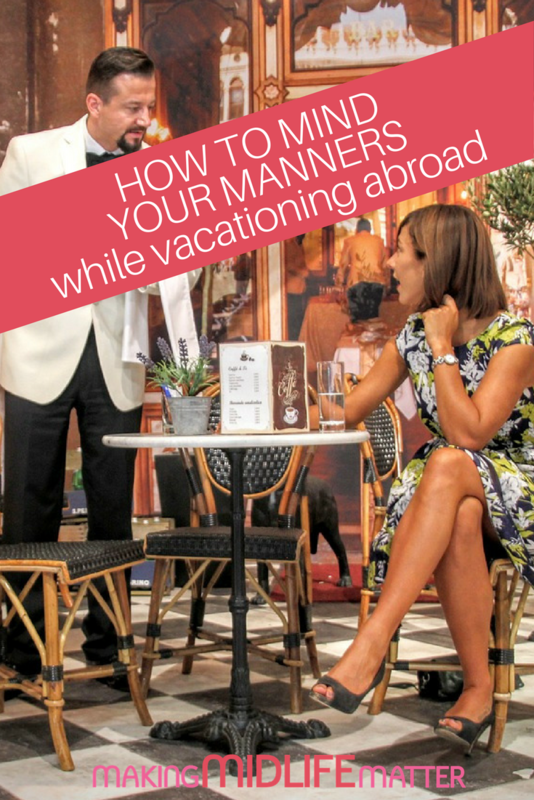 Like a good houseguest, minding your manners when you are vacationing, ensures you will be welcomed back again next time.